This Case Study looks at Inverness, a sheep and beef farm, straddling State Highway 1 just north of the Parnassus township in Canterbury. The property contains two blocks the first is a stunning block of land rising from sea level at the coastal boundary to 1800 feet (550m), and at a smaller property south of Parnassus. The size of the farm is 1200 effective hectares including the 60ha irrigated. This Case Study looks at Inverness, a sheep and beef farm, straddling State Highway 1 just north of the Parnassus township in Canterbury. The property contains two blocks the first is a stunning block of land rising from sea level at the coastal boundary to 1800 feet (550m), and at a smaller property south of Parnassus. The size of the farm is 1200 effective hectares including the 60ha irrigated run-off block and includes roughly 400 hectares of flats and 800 hectares of hill country, based in drought prone, North Canterbury. The front country blocks have been through a series of development and the coastal blocks were undeveloped and low producing. These coastal blocks were identified as an area of potential with 250 hectares identified for improvement/development. These development blocks were old native pastures full of high acidic weeds and soil tests and assessments showed high thatch, Mg and Al levels and most problematic biological inactive soils. Amy Duckworth a Soil Consultant from Soil Matters, a Canterbury based Soil consultancy focussing on utilising biological nutrients to enhance crop yields and animal performance, was called in by Farm Manager Luke Jamison to help remedy these issues. The high thatch and OM soils had created a fungal dominance and anaerobic soil environment limiting OM recycling and healthy biological activity. In order to get the soil ready for replanting it was recommended to add a healthy dose of beneficial soil microbes to stimulate the biological activity and breakdown the thatch. The Soil OM levels were showing between 7-8% on the soil tests which if recycled properly can make macro nutrients and trace elements available for plant. For example in good conditions and with active soil biology you can extract up to 15kg of free N per percentage of OM in your soil. 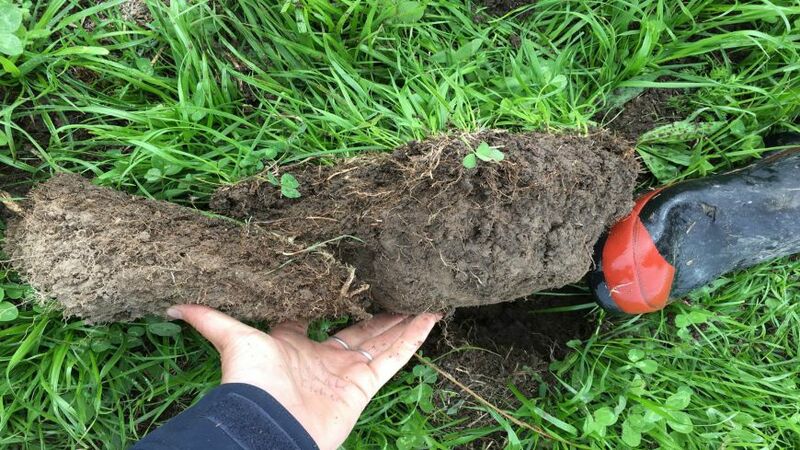 So with 7% – 8% OM in the soil this can potentially mineralise 105Kg-120Kg of N. Conversely poor OM, aeration and soil biology will mean that you mineralise very little and even lose N through immobilisation. EM was used as the microbial inoculant and included a herbicide to blow out the native pasture and weeds. The microbes in EM are proven to accelerate the breakdown of OM in the soil, converting organic matter and carbon into food for plants and soil humus. This process leads to improved soil health, structure and microbial activity. Earthworm numbers will also increase with the use of EM, to further aid soil health and performance. With thatch and OM levels so high, it was crucial that we add an additional food source to speed up the decomposition process and limit potential immobilisation. So we added a Nitrogen source in the form of UAN at a low volume (5L per ha). UAN provides N which is crucial in this scenario. To explain why? Generally plant residues in the soil, especially high thatch soils, have too little nitrogen for the soil microbial population to convert all of the carbon into their cells. If the C:N ratio of the decomposing plant material is too high (30:1) the soil microbial population may take nitrogen in mineral form or even stop recycling at all which prevents the plants from getting access to all of the minerals made available, particularly N, during the recycling process. The below images shows a soil sample (image 1) from both the native and developed land. This is from adjoining paddocks and the samples were over the fence from each other (about 15 metres apart). The sample on the right is from the developed land and clearly shows the improved water infiltration, the sample on the left has a definitive thatch layer which blocks water from reaching the soil below this level. The second image shows the differences in DM and pasture quality between the treated and untreated paddocks. A special thanks to Soil Matters for allowing us to use this information and for the ongoing support in using EM as part of there onfarm recommendations.